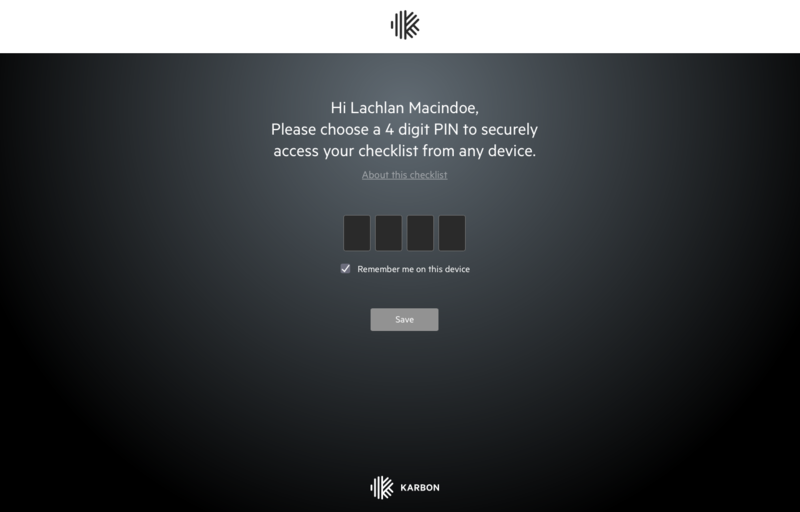 Your clients will be given an experience of Karbon that is straight-forward and easy-to-use. When you use client tasks, your clients will receive emails outlining the information you need them to provide. This article outlines exactly what your clients will see when you assign and send them tasks. Please note, for communication with your clients, client tasks are referred to as a checklist. Remember, if at any stage you'd like to see the client task emails that are being sent to a client, simply look on their contact Timeline. When client tasks are first sent, your clients will receive this email. 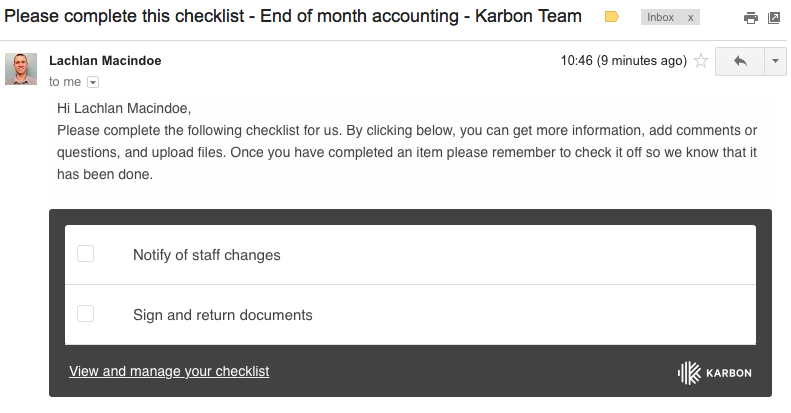 Note, the email sender will be the work owner (if automatically scheduled) or the team member who clicks Send tasks now, your company name will appear in place of 'Karbon Team', and your work name will appear in place of 'End of month accounting'. The first time your client accesses their Tasks, they'll see this page inviting them to choose a 4-digit PIN. In this example, if you have added a company logo in Karbon, this will appear in place of the top Karbon logo. 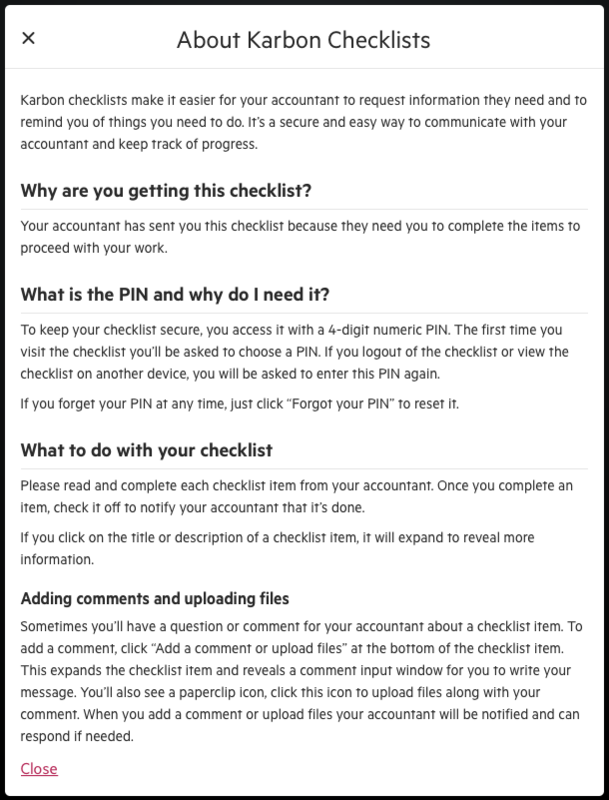 The above screen gives your client an About this checklist link for more information. They'll also have this option when they click through to view their Tasks. This is the information this link will show them. Your clients' will see a view of Karbon just like this once they choose a PIN. Your own company logo will appear in place of the Karbon logo in the top right, and the Work name and contact name will appear in the header. Clicking on a task will expand it, giving your client the option to add a comment or question, or upload a file. Clicking the gray box to the left of the task name will mark the task as complete. If you add a comment to a task, your client will be notified by an email. This email will send approximately 10 minutes after the comment/s are added.